If you’ve avoided scrubbing the dirt and grime out of your grout, you are probably looking for the quickest and cheapest way to make it sparkle. Like many homeowners, you’ll turn to YouTube videos for DIY cleaning tools and techniques. Don’t be fooled, though: Just because it looks like it works, doesn’t mean it’s good for your grout! Homeowners and business owners wondering how to keep grout white usually resort to toothbrush-like scrubbing tools, working for hours on the floor or backsplash. Those who are really committed purchase any number of large-scale specialized scrubbers and scaling tools, or even motorized scrubbers. They set to work, hoping these tools will somehow give them an advantage in cleaning grout. The problem with all these tools is that they merely move dirt around within the pores of grout, without fully extracting. 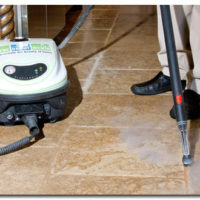 If grout is not cleaned down to the pore-level, it will always remain dingy and dirty looking. So, while you’re spending money, time and elbow grease to try to clean your grout, you’re merely touching the surface. The Grout Medic uses steam technology to safely clean the pores of your grout, avoiding the damage of harsh tools that might cause a full tile regrouting job. One fad sweeping popular DIY websites like Pinterest and YouTube is the homemade power brush. Essentially, this seemingly nifty tool is a homemade knock-off version of super expensive brush sets you can buy at home improvement stores. DIY-ers mount a scrub brush on a power drill, with the thought that the spinning of the drill will allow for quicker and more efficient grout cleaning. This “tool” is inherently bad for grout cleaning, with the hard bristles and speed endangering the integrity of the grout. 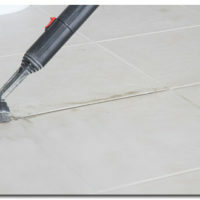 Additionally, using a high-speed drill can be hard to control, potentially scratching grout and tile. Cleaning grout this way also puts you at risk of injury. It’s not safe to modify a power tool to use in a way other than how it was intended. Another potentially hazardous fad of DIY cleaners is to use baking soda and vinegar for grout cleaning. While more natural and gentler than bleach, vinegar is not safe for grout. With an average pH of 2.4, vinegar is an incredibly acidic liquid. Using any kind of acidic liquid on grout will shorten its lifespan and corrode its structural integrity. The fizzing created by the famous baking soda-vinegar combination just foams, hisses and creates a big mess. If you need your tile and grout to be cleaned, but don’t want to take the chance of damaging your tiles contact your local The Grout Medic today.